Every time we meet with chefs from around the globe, we get inspired to try new things. Hopefully, our equipment brings out the creativity to keep pushing the boundaries of what we declare to be cuisine. At ICC, we share stories and react spontaneously in moments of pure, uninhibited inspiration. We poured store bought Bloody Mary mix into our Rotary Vacuum Evaporator. The distillate had the powerful aroma of the base and a smooth, balanced flavor profile. We looked at the other flask and saw something even better. Ketchup. Not only was it a pretty tasty ketchup, it smacked of Worcestershire and celery. A powerful wallop of spice snuck up on the back of the palette. We stopped over by our neighbors at Waring Commercial for some of Sam Mason’s pomme frites. 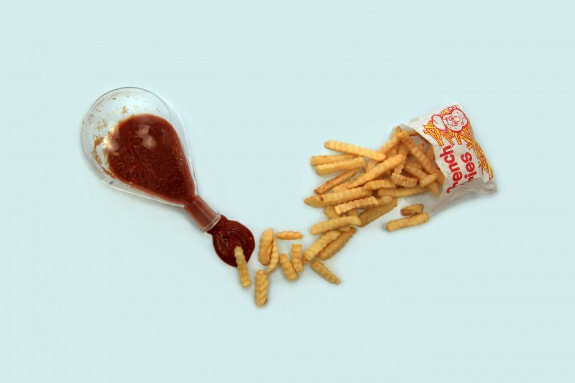 When Jeffrey Steingarten dipped his first fry, we thought we were doomed. Then he went back for seconds. Combine all ingredients in a large pitcher. Carefully funnel 1 liter of mix into 3L evaporator flask and clamp to the vapor tube of the Rotary Vacuum Evaporator. Distill until evaporating flask has reduced Bloody Mary Mix to a ketchup-like consistency, approximately one hour. Remove clamp and receiving flask. Transfer distilled Bloody Mary mix to a clean vessel or vacuum seal. Distillate can be refrigerated for 2 weeks or frozen up to one year. Use as an addition to cocktails or poaching liquid. Can also be frozen in cubes to add a Bloody Mary perfume to mixed drinks. The distillate will have no salty flavor, but will remain mildly sweet. Remove and carefully transfer concentrated Bloody Mary Mix, now apple ketchup, to a clean vessel or vacuum seal. Ketchup can be refrigerated for 4 weeks or frozen up to one year.